A version of this article was originally published in ForbesLife India. PDF version of the article is available here – PEDICABS. 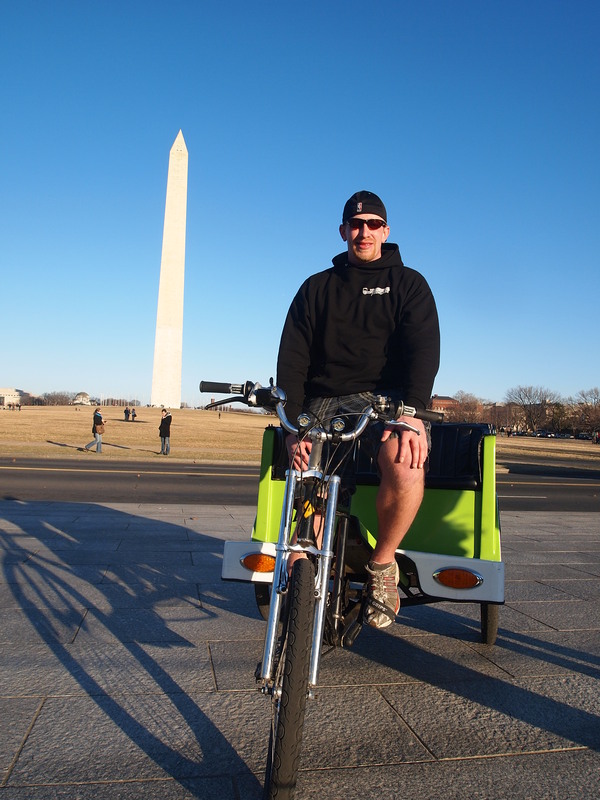 For the past two years, Will Visbeck has been honing his skills as a driver of a pedicab – known to the rest of the world variously as cycle rickshaw, cyclo, becak or trishaw – on the streets of Washington, D.C. It has no roof, doors, seatbelts, airbags, rear-view mirrors or stereo systems (though headlight, taillight and turn signals are in evidence) but we do get to make leisurely circles around statues and monuments as our driver keeps up his commentary of the sights. The best part of the trip turns out to be our ride to the White House from the Capitol, straight down dedicated bike lanes in the middle of Pennsylvania Avenue. We trace the path of the Presidential motorcade to the White House after the swearing-in on the steps of the Capitol. The absence of a median on Pennsylvania Avenue suddenly makes perfect sense. The ride is fun, the conversation engaging and the experience an eye-opener. And it could not be more different from my recollections of the cycle rickshaw trips I took as a young girl while on summer vacations in Thiruvannamalai, Tamil Nadu. Try as I might now, I don’t detect the sense of urgency or the grim determination of those drivers from long ago as they pedalled laboriously over bumpy, unpaved roads with human cargo. Those rides, transacted with the minimum amount of talking, ended more often than not in heated arguments over the fare. Although there were other opportunities later on, I never rode again in a rickshaw. My parents avoided the ones in Kolkata, unwilling to be pulled by a man running on bare feet. Much later, as a parent myself, I was happy to merely watch other people in the cyclos in Hanoi’s Old Quarter, preferring to walk instead. When it was my turn to decide whether to get into one or not, I discovered that I did not want to be the weight the drivers had to lug around. 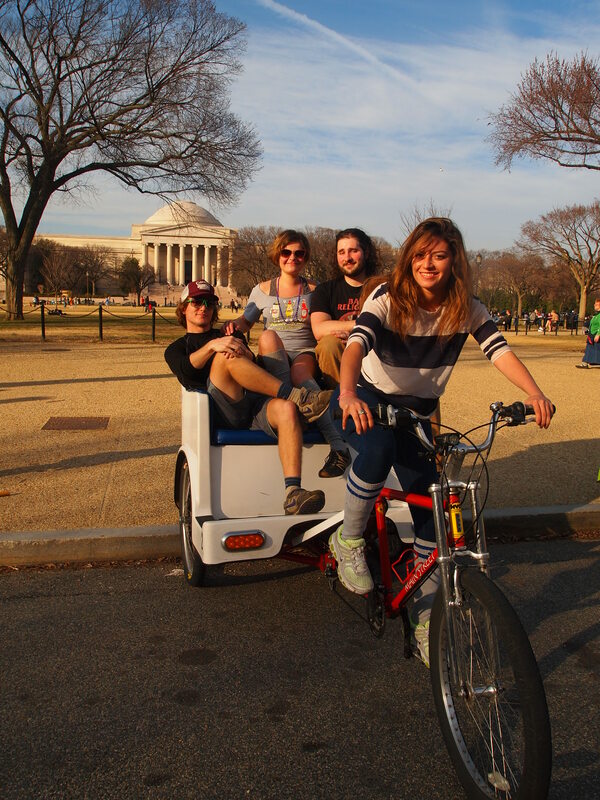 So how did we come to find ourselves in a pedicab in Washington? Well, they looked like a whole lot of fun every time we saw them, filled with passengers – three comfortably, sometimes even four – who looked like they might have just been given the run of their favorite candy store and drivers with nearly the same demeanor. On a seasonably cool but uncommonly blustery day, we decide to find out for ourselves and book a one hour tour of the National Mall, Washington’s two-mile stretch of tourist heaven with wide open spaces, museums and monuments. Even as we get ready for the ride, some of the disquiet from our earlier lives creeps in and we ask our driver if he’s all right doing this. His laugh and the ready “Yes!” are sure signs he has encountered this hesitation before. But not for the first time since I laid my eyes on the incongruent sight of a loaded cycle rickshaw inching its way up a busy Washington street do I wonder why a pedicab? Why in Washington? I am not really sure what I expect in terms of a response, but I’m pretty sure it is not this full-on endorsement of ‘pedicabbing’ (a verb coming soon to a dictionary near you) as a means of exercising, enjoying the outdoors and earning a decent income. The history of the rickshaw is long and controversial, starting with who gets the credit for the invention. Ironically enough, two of the contenders are Americans (the other three being Japanese), one of them a Baptist minister who is said to have come up with the blueprint for the rickshaw so he could transport his sick wife in Japan in the late 1800s. The idea soon spread to other Asian countries. In the 1940s, human cyclists replaced human runners and cycle rickshaws took over. In cities such as Kolkata, where runner-pulled rickshaws still ply the streets, there is a constant debate between those who denounce the practice as exploitative and others who point out it is often the only source of livelihood. Although municipalities struggle to contain their proliferation, cycle rickshaws remain popular and viable in many countries around the world. The dichotomy between the paradigms for the same service in the old countries and in the new could not be starker. Steven Balinsky, an owner-operator of Capitol Pedicabs, and Jamie Trowbridge, location manager for National Pedicabs, have ridden cycle rickshaws in Thailand, China and Colombia, where they have been an integral part of the cityscape for more than three-quarters of a century. As in India, cycle rickshaws here are run by rural migrants with limited marketable skills in urban settings, and offer an inexpensive, everyday transportation option for locals. The three pedicab companies operating in the city orient their marketing to appeal to their mostly American clientele: riding a pedicab is fun, faster than walking, and involves less time in traffic jams. They emphasise that human-powered transportation is green and worth importing. “Globalisation goes both ways,” as one company’s website notes. Discovering pedicabs while in high school in New York, Balinsky found that it allowed him to set his own schedule and be his own boss while earning money. He is now studying for a master’s degree, while owning-operating his company. Trowbridge’s interest in environmental and social justice advocacy dovetailed neatly with a business model that relies on low-carbon emission vehicles, presents low barriers to entry for drivers but manages to be profitable for everyone involved. When he first started last summer, he worked as an unpaid intern on Capitol Hill by day and got his workout and his income driving a pedicab by night. Madelyn Troyanek’s incentive was slightly different. Back in 2009, she was looking for a good way to get fit. “Getting paid to exercise was a good incentive,” she says, adding that she pedicabs when she is not working toward a degree in the fine arts. If the references to the female gender cause you to do a double-take, rest assured you are not alone. Women make up about a third of the 60-odd drivers in this city, but passengers are still taken aback when they see a pedicab manned by a woman. “There’s no way you can haul me,” is a constant refrain Troyanek hears. They don’t realise, however, that the bikes have 21 gears, and “I prove them wrong,” she says. “People are impressed I can take them places,” says Sarah Roberts, a sociology student, all of 5ft6in and 140 pounds. Roberts recounts the tale of three tipsy guys she ferried from a baseball game at Nationals Park. They were convinced she could not possibly pull their combined 600-odd pounds, especially over a steep hill just outside the stadium. Amid good-natured ribbing, she got them where they needed to be and bagged their grudging admiration and a hefty tip. Among the drivers I talk to are students, entrepreneurs, photographers, a freelance writer, a musician, a social and environmental activist, and a teacher. Unlike in many other countries, no one, it appears to me, has turned to pedicabbing as a last resort. For Edith Roscoe, a Washington-area resident, a pedicab ride tops off a lovely night out for her birthday. “It was awesome to be in that little thing out in the traffic,” she gushes. The tourists I run into near the Smithsonian Museum on a pleasantly warm and sunny late February afternoon seem to agree. Lauren and Kennedy, two 15-year-olds from San Francisco, are awed by the majesty of the nation’s capital and suitably impressed by the “coolness” of a pedicab ride. A tourist from Alaska appreciates being able to get to his destination without having to wait around for a taxi. 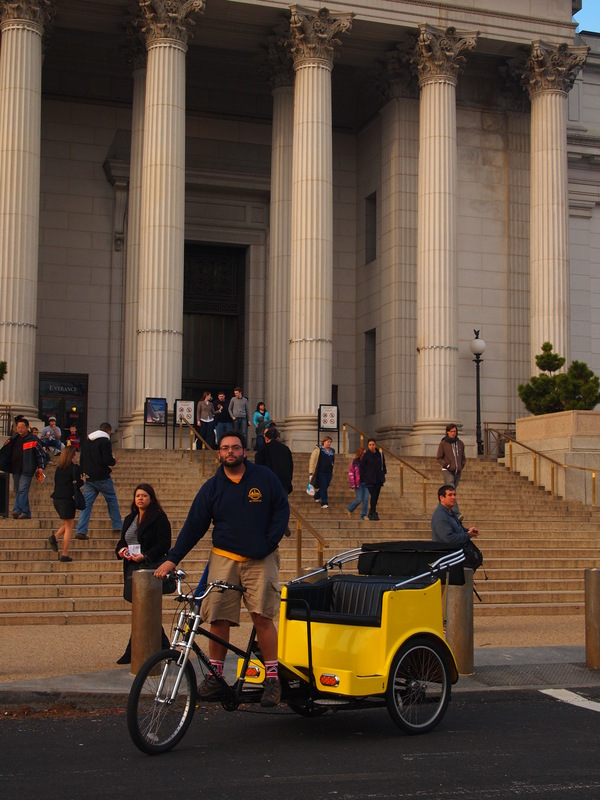 Three museum-hoppers walk briskly up to a pedicab in front of the National Museum of Natural History and want to get to the Air and Space Museum on the other side of the Mall before it closes down. The distance is too long to walk if you’re in a hurry, too short for a taxicab, but just right for a pedicab, especially when you spy one waiting to take you. Blake Warenik, a freelance writer and pedicab driver, chats amiably until he sees a group of people streaming out of the museum. As I walk away, I hear his pedicab’s bells chiming, calling out to potential patrons. I think to myself that if I ever need a quick ride from a museum or an art gallery to where my car is parked and I see a pedicab nearby, I’m jumping in. 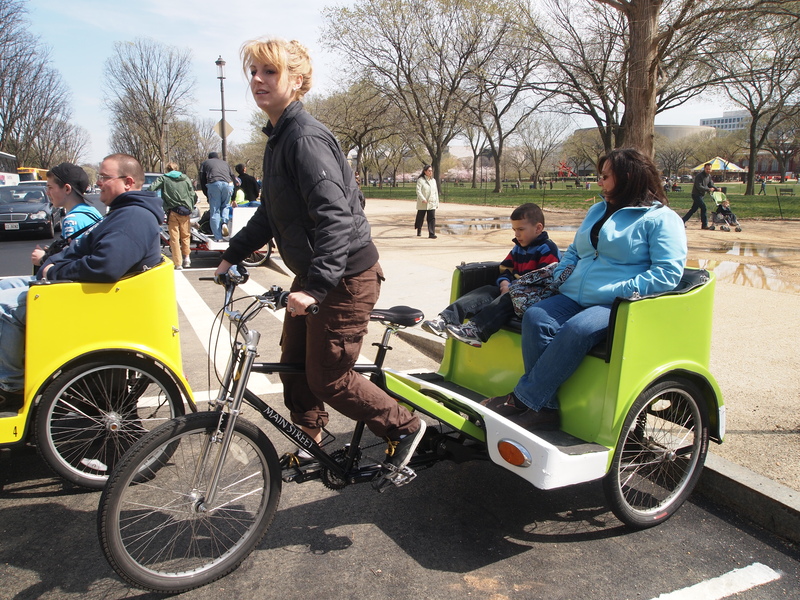 Pedicabs, in theory, are available all year round in Washington as long as the weather is hospitable, but in the busiest season is between March and October, when the bulk of Washington’s 15 million tourists descend on the city. During winter, night-time tours of a city lit up for Christmas get some traction. Services on offer fall into three broad categories: Short destination rides on pedicabs you flag down on the street, pre-booked city tours and event based rides for weddings, conferences, birthdays and anniversaries. Since there are no meters on the pedicabs, pricing for short rides can vary from around $5 (about Rs225) to around $20 (Rs900), depending on the distance. Many drivers leave it up the passengers to assess the worth of a ride at the end of the trip. The pricing and duration of event rides are fully customisable and unique to each event, while the cost for a city tour runs about $60 (about Rs2,800) an hour. Visit National Pedicabs (www.nationalpedicabs.com), Capitol Pedicabs (www.capitolpedicabs.com) and DC Pedicab (www.dcpedicab.com). 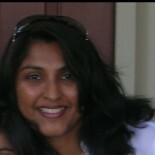 This entry was posted on September 5, 2011 by Sujatha Bagal in Articles, Published, Travel Writing and tagged ForbesLife India, Washington DC, Women.